Google Nose? Wait, did they put a diffuser in the Android phone? Does it need a refillable cartridge? Is there a CMYK of smells? What combination would create a lemon scent or a wet dog smell? All very intriguing. Then, it was clear, Google put this out on April Fools Day. But smell interfaces are no joke! There is a long history of smell paired with media, and new opportunities to explore. I am just not sure they could quite fit into a smartphone…yet. Scents are a powerful component of our experience. Smell creates memories. Like the smell of gasoline in the rain, reminds me of boating in lakes as a child. Think about how many times you have said, “This smell reminds me of…,” and you are redirected to a memory. I was lucky to try the Meta Cookie from Japan. It is a smell and taste, augmented gustation interface that makes tasteless cookie into what ever you like. Well, eight flavors like chocolate, lemon, maple, or even cheese. The cookie is stamped with a AR code that creates a cookie visual and smell is added when it nears your mouth. Did it work? Almost! The only problem was the burnt taste from branding/burning the code in the cookie. Who wants to eat a burnt cookie? But, that could be fixed by using dye or poppy-seeds? I am sure they are working on that. If you don’t want a face helmet, how about The Smelling Screen? It is a screen with scents that can waft from four locations. If the peach is low left corner of the screen, the smell can emit from there. In the 1960s, movie entertainment began adding more senses to create an olfactory, memorable experience. Smell-o-vision (1960) paired with the movie, Scent Of Mystery. At specific scenes, 30 different scents were pumped out to each seat in the theatre. The experience was not seamless, as the audience complained that the smells were too loud. The fragrances hissed into their ears, and disrupted the movie. 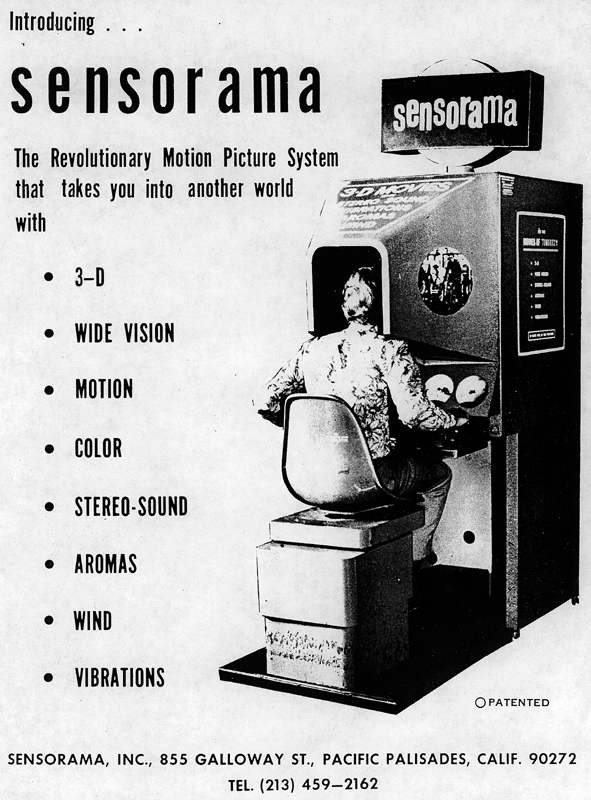 SENSORAMA (1962) was created by Morton Heilig as “Experience Theater.” This was a personal multi-sensory theater with wind, vibration, sound, and smell. 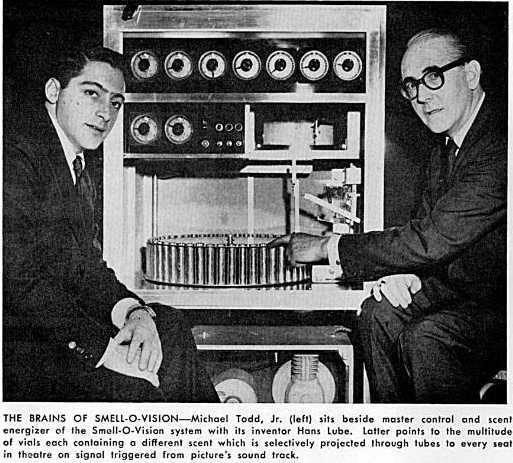 This was a grandparent of virtual reality. We are not sure why these did not populate the cities. Apparently, the inventor was not able to get financial backing to develop, but the prototypes still work today! So, there you have it. Smell media is no joke. From the 1960s motion pictures to current day in Japan, we are intrigued with enhancing our media experience with the sense of smell.